Start by cooking the brown rice in water according to package directions. About 10 minutes before rice should be cooked, begin to prepare your tacos. Grab a large bowl and toss your chicken with garlic, vegetable oil, chopped cilantro and Knorr® Selects Chicken Bouillon. Now, get your large skillet nice and hot and cook your chicken until done, about 9 minutes. Don't forget to give it a stir to brown all sides. Sprinkle with lime juice and you're done. Have your family build their own tacos. 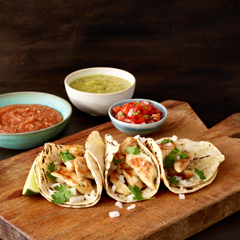 Start by stacking 2 tortillas topped with chicken, cilantro leaves and diced onion. Finally, toss the salad greens, tomato wedges, and oil and vinegar in a salad bowl. Serve tacos with salad and rice.